Jewelry takes mind off your wrinkles! Well what do you think is it true? Jewelry is an assortment of tiny glories bundled together to give you an appealing look. Sporting new jewelry is delightful and so is to know how it is made, isn’t it? Here you will get to know what all procedures and tests your little gem goes through to get that sheen and shine. The foremost step, Designing where all the technicalities are sorted, creation and crafting of the ornament is chalked. The designers and craftsmen cater a thorough knowledge of gems, fabrication, and market fashion and hence with these leads they project their creativity and ideas on paper. After a competitive and surreal work they prepare some extra ordinary designs, which after getting finalized are mocked into technical drawings. These technical drawings elaborate on the details and description of the jewelry to be created. Be it the matching of stones, choosing of metal or balancing contrast of stones each and every step is catered with passion and precision. The size gradient is estimated and after all the work is put up on a paper this technical sheet is forwarded for manufacturing. After the designs and technicalities next thing which follows is making a permanent mold. Carving on a hard sponge is carried out and then this mold is filled with liquid wax via wax injector. After the cooling of wax the mold is taken out and is taken for metal cast. Metal skeleton is crafted and then it starts its journey of drilling, filling, setting, steaming, heating and polishing. This procedure involves making of holes and the needed gaps and spaces for gems tones and stones. A huge chest of instruments sits in the drawer of a worker which eases his work. A skilled craftsman is aware of the dimensions and measurements hence; a flawless drilling of holes takes place, for pave settings, laser cutting and drilling takes place which makes the setting precise and unmistakable. 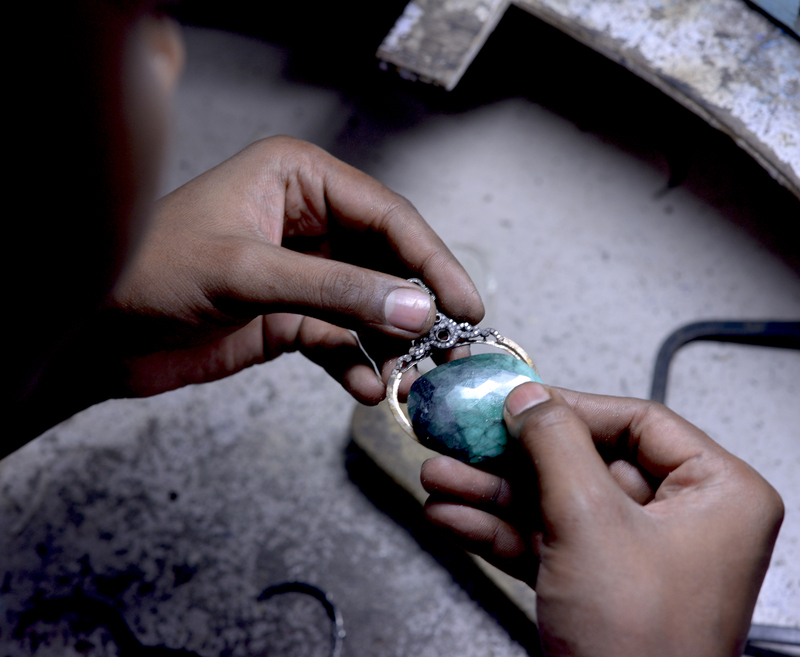 The arrangement of gemstones is the next task and with a very skilled and refine movement the craftsmen put the stones in the metal cast. Setting diamonds in the jewelry piece is the next task, very cautiously diamonds and other precious gemstones are colonized in the holes. Until here a coarse metal and gemstone studded jewelry is made which needs final polishing to set off. Steam cleanses the jewelry softly and then polishing adds the desired shine and glow to the jewelry product. The jewelry is now forwarded for quality tests, where its quality and durability is screened. This is how a rock glistens into a shiny diamond, and in this way a design on paper is transposed into a glorious piece of jewelry.